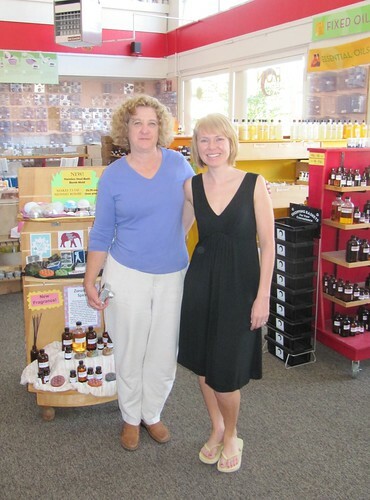 Last week, I was supremely lucky to spend almost two full days at Otion with a private soapmaking student. 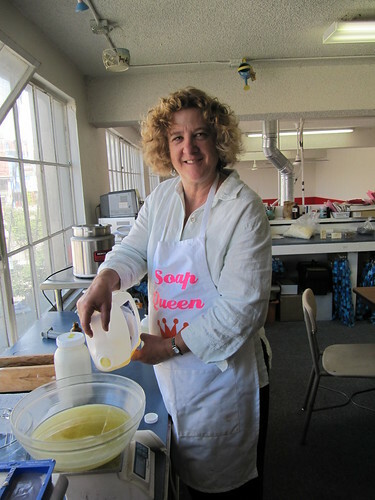 Diane visted us from Watsonville, California to learn more about soapmaking and how we run Otion. 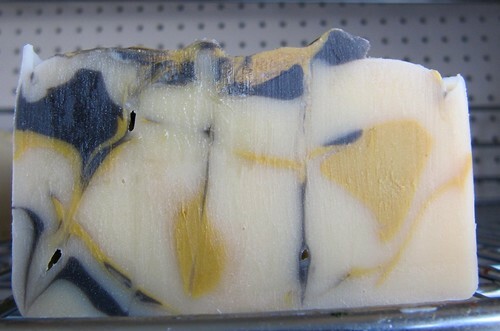 She and I spent one full day exploring Cold Process soap. 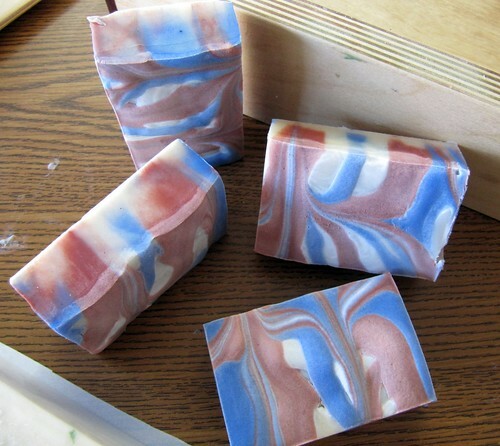 First we designed three key recipes for her based on her personal preferences around what a ‘good’ soap makes. Then, it was time for a serious soaptopia at Otion. We played with pigments and explored swirling in the Birch wood Molds. We enjoyed working with honey and focusing on temperatures to inhibit superheating (caused by the honey). Soap on right? Never got above 97 degrees. Soap on left? 145 for over 20 minutes. Same recipe. Same additives. Temperature was the only variant. 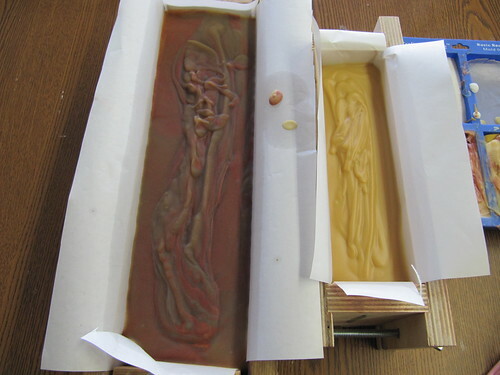 Then we made a basic layer soap. That’s Ultramarine Violet on the top and Super Pearly White Mica on the bottom layer. 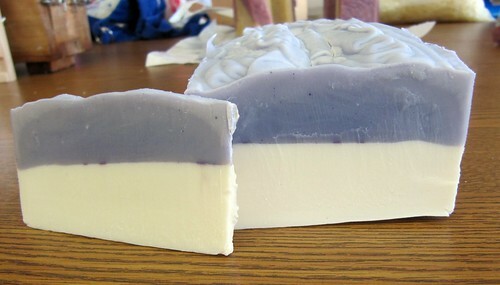 Can you believe this is Goatsmilk soap? No tan color and no ammonia smell. It’s a technique I’ve been exploring for a new e-book on goatsmilk soapmaking. Colors are Black Oxide and Yellow Oxide. Thank you Diane! We loved spending time with you. It was an honor. Hi Michalah! We are actually still working on the Goatmilk E-Book and it should be out soon! Keep your eyes peeled for it! Or you can work with most of our instructors for $45/hour. My price per hour for one-on-one time is $95/hour and we have three other instructors at the $45/hour mark. Next year, plan a trip out for SWI at Otionsoap.com We’re full for this year (with a waiting list!) but we’d love to host you. Patience little grasshopper, patience. It’s all about super duper stick blending the bottom layer, while keeping the 2nd layer nice and liquidy until you are ready to pour. =) I’ll do a tutorial on that one of these days. So much fun! What would it cost to spend an entire soaping day at Otion? Wish I didn’t live across the country……. Love your new hair cut and the new header. Very nice.